I have been looking for a good recipe for the ground meat filling of the traditional Vietnamese dish Bò Nướng Lá Lốt, which is a beef roll wrapped with betel leaf (lá lốt) and grilled. The wild betel leaf compliments the beef when the two have been grilled together. The betel leaf releases a subtle exotic aroma that is hard to describe. My attempts at recreating the filling using basic combinations of ground beef with lemongrass, fish sauce and garlic had fallen short. A variation of the traditional Vietnamese dish Bò Nướng Lá Lốt, these rolls are pierced with fresh lemongrass stalks, which provide a convenient handle for dipping the rolls in a sauce. With the stalk, it becomes a Vietnamese meat pop. The other day while searching for a hamburger with a Southeast Asian spin, I fed the Google search monster the text string Thai basil hamburger. Their PageRank algorithm promptly belched 198,000 hits, of which exactly one was relevant: Thai Basil Beef Burgers with Spicy Sweet Chili Dipping Sauce by Kristi at the food blog Inspiration Kitchen. Kristi’s recipe was originally sourced from a beef roll recipe at Serious Eats. It has familiar ingredients of Southeast Asian cuisine, such as Sriracha Hot Chili Sauce, fish sauce, green onions, fresh mint and Thai basil. The recipe looked intriguing so I made a small batch of Kristi’s Thai basil hamburgers. For the main condiment, I spread Mae Ploy’s Sweet Chili Sauce on the grilled patty. My first impression was a sensation of mustard and pickles although neither was on the burger. In the end, what I liked most about the burger was the way that the Sriracha Hot Chili Sauce added pizazz and punch to the meat. The Sriracha brought a background heat and a framework for enhancing the flavors of the other ingredients. After tasting the burger for a while, it dawned on me that Kristi’s burger recipe would make an ideal filling for Bò Nướng Lá Lốt. The Sriracha brought an extra depth of flavor to the filling that was missing in my previous attempts. On the following weekend, I made a batch of the burger recipe, but with three additions: ground pork, betel leaf and lemongrass stalks. 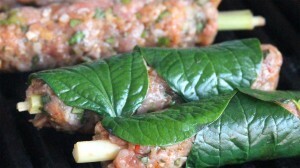 The ground pork would add yet more meaty flavor, and the stalks would make good handles for dipping the rolls and also potentially release lemongrass essences into the filling during grilling. I thank Kristi at Inspiration Kitchen for posting the Thai basil hamburger recipe, which provided a very tasty filling for one of my favorite Vietnamese dishes, Bò Nướng Lá Lốt. Now, back to Vietnamese cuisine and to the ancillary topic of dipping sauces. 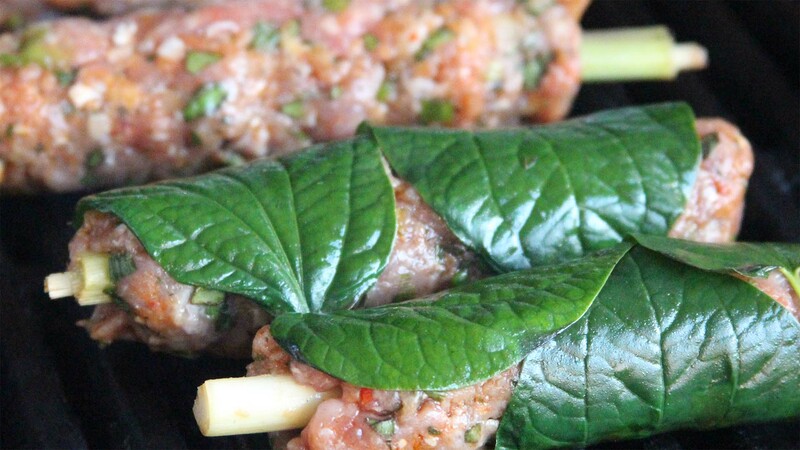 In Vietnam, beef wrapped with betel leaf is sometimes dipped in an uber pungent fish sauce known as Mắm Nêm (pronounced mom nem). Mắm Nêm consists of fermented anchovies and fresh pineapple. This sauce should be on everyone’s bucket list of Weird Stuff to to Taste. Mắm Nêm takes the concept of fishiness to a new level (kind of like what fish mint does for herbs), yet it works perfectly as a compliment and/or counterpoint to the grilled beef and pork. Another condiment to use is the fried shrimp chip, also known as bánh phồng tôm. These are easy to make in a wok or frying pan. The shrimp chips are usually available at Asian markets. 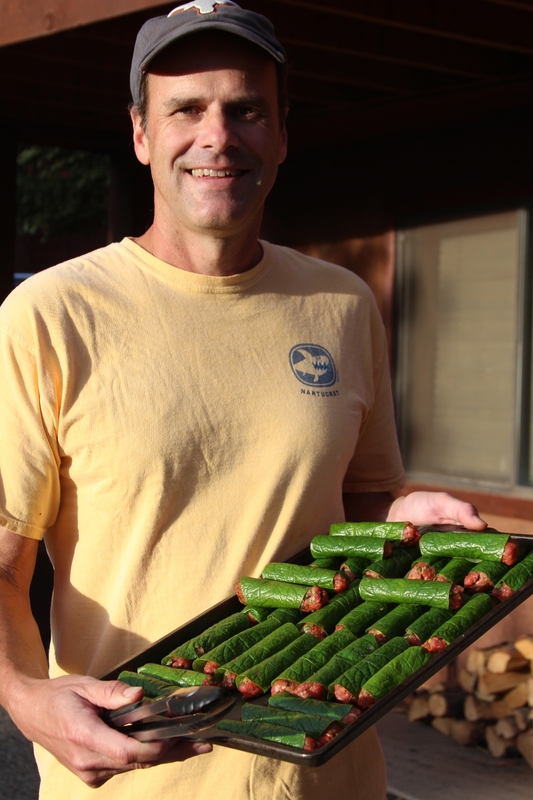 The author with a tray full of beef and pork rolls wrapped in betel leaf. Angel Fire, July 2014. Combine the ground beef and pork in a large bowl. Spread the meat over the inside surface of the bowl. Sprinkle the remaining ingredients all over the ground meat with the goal of getting an even distribution. Gently work them into the mixture. Do not overwork or over-compress the meat. Treat it gently! 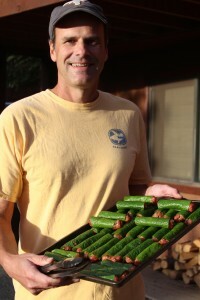 Next, cut the lemongrass stalks into lengths of about six inches or less and put them on a tray. If the stalks are too thick, cut them in half. Then, grab enough of the ground meat mixture to make a roll that is about four inches long and an inch and a half thick. (Or use whatever dimensions make sense for you.) Press the mixture around the top four inches of the lemongrass stalk, so that the top portion is completely covered with a layer of ground meat. Leave the bottom two inches uncovered. The bottom part of the stalk will act as a convenient handle for dipping the roll into sauces. 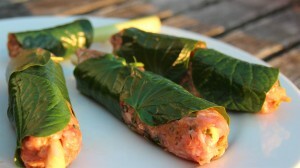 Wrap the rolls with the heart-shaped betel leaves. 100% coverage is not necessary. The main goal is to make sure that most of the surface is covered. These rolls are plenty tasty with or without the betel leaves so don’t sweat it if they are not available. Grill the rolls over gas or charcoal on medium high heat. Cook them like sausages, turning them periodically so that the rolls are cooked through on all sides. Family and genus of wild betel leaf: Piper sarmentosum. Bo La Lot recipe variation. Bo Nuong La Lot recipe variation.